Volunteers have been an integrated part of Yaowawit’s family since the beginning. They stay with us and help the children on daily teaching and some administration activities. In doing so, they can learn to live in a culture different from theirs and meet friends from different parts of the world. Here, we feature interviews of our current volunteers regarding their expectations, experiences and transformed perspectives. How did you know about Yaowawit? I looked for a social project in south Asia on the weltwärts website. Then I contacted the kolping organization and they provided me the opportunity to come to Yaowawit as a volunteer. Which Yaowawit’s information channel did you read first to learn more about Yaowawit? I first read about the school on the Yaowawit website. I really enjoyed watching the video about the school in particular. What was your expectation when you decided to be part of Yaowawit? At first I did not know what to expect because Yaowawit is such a big project with a lot of different aspects. It is not only about the school, it is also about pre-vocational lessons, the farm and so many things that taking place. I thought about getting involved in art projects, English and swimming lessons. What is your responsibility/task/assignment at Yaowawit? At the moment I am a teacher assistant in English and art classes for Grades 2 and 3. I have one day in kindergarten, one evening as a study buddy and on weekends for swimming lessons and afternoon activities. Apart from that I always have different tasks in office work. How is your Yaowawit’s experience now fulfilling your expectation? It is better than I would have dared to hope. I am so glad and thankful to be part of this wonderful school. What are you going to do after Yaowawit? I am going to study medicine at the university of Bonn. How do you think your Yaowawit’s experience will help you then? I think whenever you get in contact with a totally different culture, you improve not only your cultural sensitivity but also your social sensitivity–especially in Yaowawit it is all about mutual acceptance and esteem. This is something that will last a lifetime. How did you know about Yaowawit? In germany we have a big organisation called “weltwaerts”. They have a lot of volunteer programmes, and I get to Yaowawit from there. Which Yaowawit’s information channel did you read first to learn more about Yaowawit? I looked at Yaowawit’s website, which was listed on Kolping’s website. What was your expectation when you decided to be part of Yaowawit? I wanted to get to know a new culture and I love to help people and see them smile. What is your responsibility/task/assignment at Yaowawit? I am helping the kindergarten teacher and Kru Yan whenever I could help. Furthermore we play to exercise English words with the kids. How is your Yaowawit’s experience now fulfilling your expectation? I love this place. It feels like home and having a kind and super big family. What are you going to do after Yaowawit? I want to study medicine in Germany. How do you think your Yaowawit’s experience will help you then? I gained experience in different ways. Be responsible on how to behave with people and I got to know a different medicine system and so much more. How did you know about Yaowawit? My mother’s friend Katja came here a few years ago and I saw pictures of the school. I found the project to be very interesting and an awesome chance for these kids. Which Yaowawit’s information channel did you read first to learn more about Yaowawit? At first I read more about the kids and the school in general to learn more about their education. What was your expectation when you decided to be part of Yaowawit? I definitely expected to spend a lot of time with the kids, teaching them English and helping with projects. What is your responsibility/task/assignment at Yaowawit? I assist the teachers in Grade 1 art and English classes and the same for Grade 4. I am also in charge of reorganising the library. How is your Yaowawit’s experience now fulfilling your expectation? I love spending time with the kids. It is better than my expectations. I learn so much by being here. What are you going to do after Yaowawit? After my stay here I will be moving to Zurich (Switzerland) to study biochemistry at the University. How do you think your Yaowawit’s experience will help you then? The stay at yaowawit will definitely help me appreciate the chances I have had and the following doors that they have opened for me. How did you know about Yaowawit? I visited Yaowawit 6 years ago with my family, we stayed for 2 days. What is your responsibility/task/assignment at Yaowawit? I assist the English Grade 5 class, and I am helping at sponsoring and marketing. How is your Yaowawit’s experience now fulfilling your expectation? The kids are even more sweet than I expected. There is so much energy here, so many positive vibes. And time goes by so fast! I thought I would miss my family more, but I think that’s not the case because I am surrounded by so many beautiful people. What are you going to do after Yaowawit? First I will travel for 10 more weeks in Sri Lanka, the Philippines and Hong Kong. And after that I will study South and South-East Asia studies at Leiden University. How do you think your Yaowawit’s experience will help you then? During my travel weeks I think it is good that I learned to eat rice haha, and to know how to go back to basic. And for my study, I think this is the best preparation that I could have. Learning about cultures and new languages. How did you know about Yaowawit? I read about it in a local German newspaper. Which Yaowawit’s information channel did you read first to learn more about Yaowawit? Yaowawit’s website and then social media like Instagram and Facebook. What was your expectation when you decided to be part of Yaowawit? I expected that I could help the school and also the children. What is your responsibility/task/assignment at Yaowawit? My task is to assist the teacher in the Grade 6 English lesson and hospitality lesson. I also do a study buddy twice a week and a reading club once a week. How is your Yaowawit’s experience now fulfilling your expectation? It is great and I am really enjoying my time here! I feel helpful and it is much fun to work with the friendly staff and the friendly children. What are you going to do after Yaowawit? I will travel a bit in Thailand and in other parts of Asia and then I will return home to start going to university. How do you think your Yaowawit’s experience will help you then? I think it is an experience that I will take a lot from. At Yaowawit I am learning how to teach children and how to work in a group. I am also improving my communication skills by interacting with multicultural staff and I am learning how to handle responsibilities myself. Helping our children through giving can be done in many ways. Our donors–either local or international–are part of Yaowawit’s big family that we are always grateful for. This week, a group of close friends reached out to make donation to our children. Khun Wanchai together with his family and his long-time friends brought pants for the children. Khun Wanchai had been a Deputy General Manager at Khao Lak Laguna Resort, and his friends each had been President of Phang Nga Fisheries Association and Phang Nga Mass Communication Association. In return, our kindergarteners performed a traditional Indian dance for them as a way of saying thank you. That day they were on a schedule for a dance practice anyway. Although Khun Wanchai and his friends refused to dance along with the children for being too rusty for any kinds of dance, Khun Wanchai and his friends welcomed the good wishes for their careers from the children. 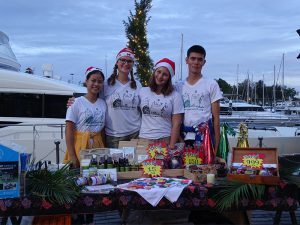 Selling products in local markets is part of our students’ entrepreneurship training at Yaowawit. 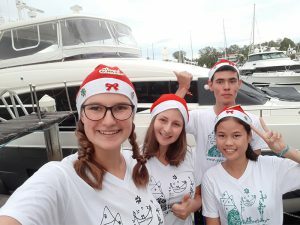 The experience gives our students a way not only to practice their English speaking skill but also to train themselves to be outgoing by communicating about the products they are selling to people they have not met before. 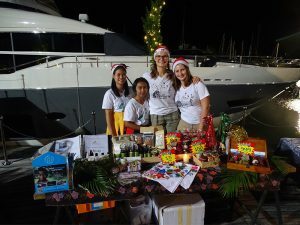 On this Christmas season, we were invited to sell our products at Phuket’s Christmas Market Boat Lagoon. In line with the season, we added Christmas-themed products, such as Christmas tree accessories, pointy hats, key holders and other decorative items, to the mix. At the market, the crowd continued to increase in the afternoon. Many people were walking among the shops and along the pier. And our table was on the pier right next to an array of boats. So, before the table was open for business in the evening, our team had some free time to enjoy the lagoon view and marvel at the boats. During the peak time, the sale was good. Thus, the team had to take turns exploring various extravaganzas in the market. For most of our children, elephants are on the top list of their favourite animals. 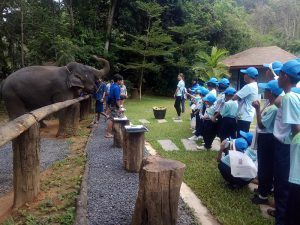 So, when Yaowawit got an invitation to Phang Nga Elephant Park, all the children wanted to go. However, the park specifically mentioned that it could accommodate only 24 students on the allocated schedule. For that reason, the teachers had to make a selection. Good behaviour, attention to lessons in the classrooms and good school reports were some of the selection criteria. It was not easy because there was no clear cut. However, the children who could not go still had good news–they can go next time after they fulfill the selection criteria. 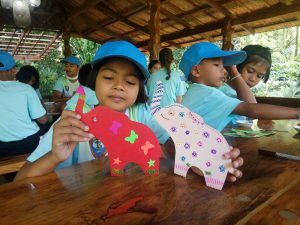 At the elephant park, the children received lessons how to be kind to elephants and how to preserve the forest for them. 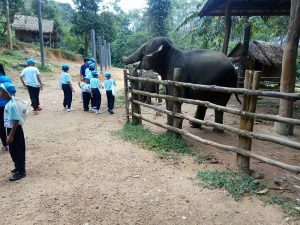 After that, the children got a chance to meet, touch and feed the park’s elephants. The elephants gave the children a ride to a shower area where the children were assisted by the park assistants to shower the elephants. 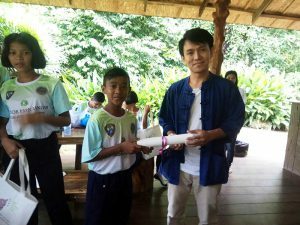 At the end of the event, Khun Jake (the park’s founder) himself greeted and thanked the children with elephant-themed gifts for visiting the park. Our children are excited to meet, feed and touch new friends. By visiting Yaowawit, you have a chance to meet happy children with shy smiles on their faces. When you talk or play games with them, you create a bond with them. Thus, after a year or two, the children still remember you and what games you played with them the last time you were here. 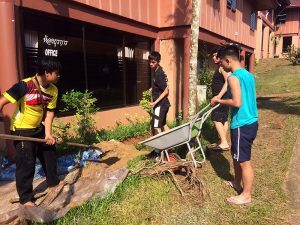 A group of seven International Christian School (ICS) students who arrived at Yaowawit today has been here several times. When they got out of the pick-up van, they stepped into the school ground right away. Soon they got crowded by their Yaowawit’s friends–our children who were welcoming them. Laughing, hugging, handshaking and hand holding took place. 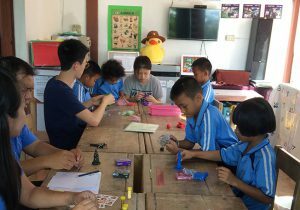 The group opted for in-school activities during their week at Yaowawit and went out only on Sunday to the local markets in Kapong and Takuapa’s Old Town. The in-school activities allowed them to spend most of their time with the children. 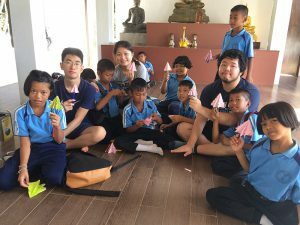 Together, they read story books, played chairball, made herbal teas, swam in the swimming pool and practiced Thai dance and aerobics. 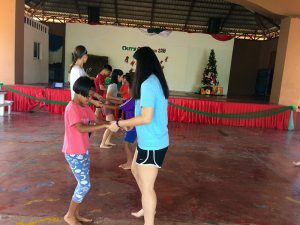 The group also joined the children’s classes. 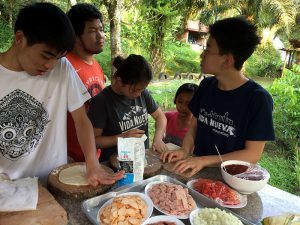 For example, together with the children, they took a hospitality class and trekked Yaowawit’s farm in a permaculture class. Enriched with a unique Yaowawit’s experience, these ICS students brought home with them good memories. As the friendship bond remained strong, the children expected them to come back again next year. 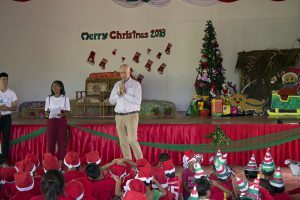 The children were excited with the Christmas party especially for the little first-year kindergarteners who had not experienced a Christmas day before. 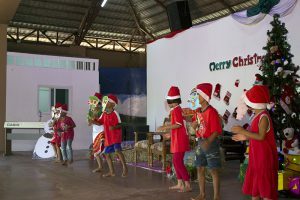 A few days before today, they got some introduction to a Christmas celebration. But the real thing was yet to come until today. These little kindergarteners were in high anticipation. The morning was filled with Christmas-themed songs. The Christmas decoration was a combination of a regular Christmas theme and an outdoor farm theme–blocks of haystacks were decorated for seats. As our guests arrived, the party started. 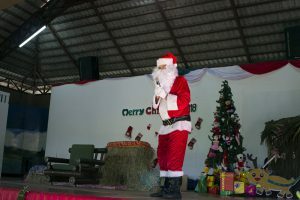 The children were seated in the front rows next to the stage, because Santa had called in days earlier that he would want to talk with the little children first when he was on the stage. The children in the front rows got the best view of the shows that their teachers and friends were performing. Their loud laughter, cheers and singing along filled the theatre area. When Santa was arriving onto the stage, the children cheered even louder. After evaluating his note, Santa was very happy that this past year the children had been very good–kind to their friends, diligent in school and obedient to their teachers. 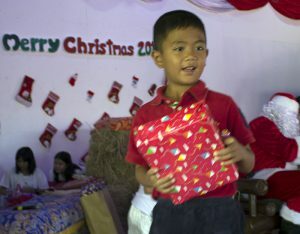 And Santa was also very happy that Yaowawit’s family had been taking good care of the children. 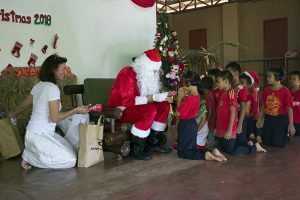 As a reward, Santa himself handed out Christmas presents to each of the children and their Yaowawit’s family one by one. High anticipation, children gather in the front row.